The Official announcement of TMMIN Karawang Engine Plant # 3 was successfully held on Monday, March 7, 2016. 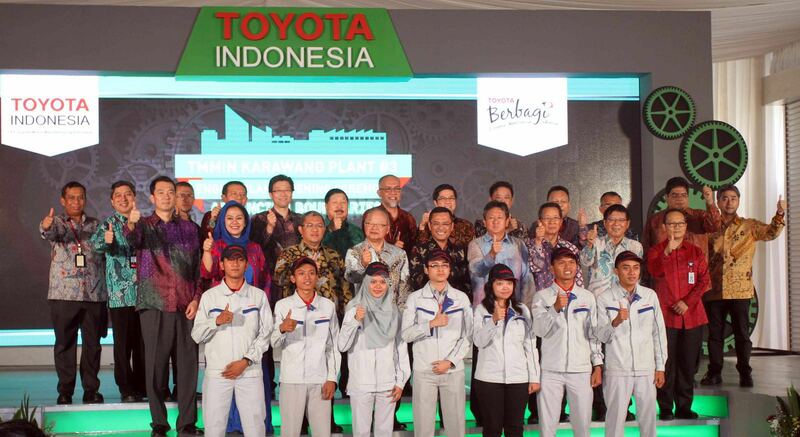 The event was attended by the Minister of Industry of the Republic of Indonesia Saleh Hussein, West Java Governor Ahmad Heryawan, Regent of Karawang Mrs. Cellica Nurrachadiana, Senior Managing Officer (SMO) Toyota Motor Corporation (TMC) K. Saga and M. Kawai. President Director PT. Toyota-Astra Motor (TAM) and TMC Managing Officer (MO) H. Fukui, President Director TMMIN M. Nonami, and Vice President Director TMMIN Warih Andang Tjahjono. This Toyota's engine plant is the first plant in the world that adopts "Through Line" which in the concept of the whole process of production machinery consists of casting , machining and assembling assembly under one roof. With this concept will certainly shorten the production process and reducing the inventory in production. Located in 150 hectares area on Industrial Estate in Karawang, West Java, the engine plant is scheduled to produce 216,000 R-NR aluminum engine every year after starting operations in early 2016. The plant, machinery, and new export activities are part of the Toyota commitment to continue on contributing to the development of the automotive industry in Indonesia particularly, and the Indonesian economy in general.